The Craighead CAverns are a series of underground caves and huge enclosed areas that make up an extensive cavern system, complete with huge underground lake. The Lost Sea, as it is known, is the largest underground lake in the USA and the second largest in the world. The underground area has a long and varied history. Native American artifacts have been found there which strongly indicate that one of the huge caverns was used as a meeting place for various tribes in days gone by. Bones have even been found that were discovered to those of a Pleistocene jaguar – Pleistocene being the official designation of what we usually refer to as the Ice Age. Amazing to think, but this entire area was once under the ocean. Over the years, after the Native Americans had moved on, the caves were used by settlers to store foodstuffs. The caves offer a constant 58° temperature so form a ‘natural fridge’. During the Civil War the caverns were mined for saltpeter and later, the cool temperatures meant that the caves were ideal for makers of moonshine – the cool temperatures and the concealed location were just right. Today it’s a tremendously popular place for tourists to visit. The tour includes a journey across the lake on a glass-bottomed boat. A fascinating fact is that the many rainbow trout that live in the lake are blind. Because they have always lived in the subterranean lake, they have no need for eyesight. But one of my favourite stories about the caverns (and there are many stories – that you’ll hear from your tour guide when you visit) dates from the 1940s. 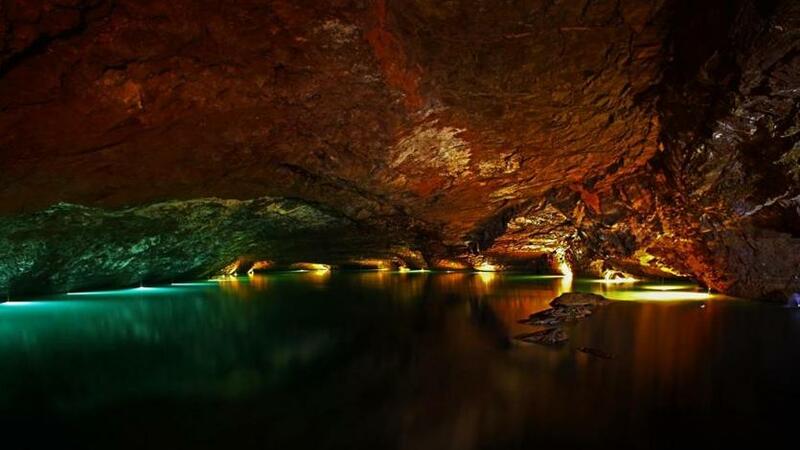 Enterprisingly, the largest of the caverns was converted into a dance hall and bar. It was called, unsurprisingly, the Cavern Tavern. It became very popular and it’s said that the 30′ height of the chamber made the music fantastic because of its special acoustics. The trouble was though that the humidity and the cool temperature of the cavern suppressed the effects of the products sold at the bar. It was only when drinkers started to climb the 130 steps to the exit that the effects of the alcohol they had imbibed affected them as they started to climb to lower humidity and warmer temperatures. This had such an effect on them that many would simply give up the idea, return to the cavern and stay there sleeping it off until the effects of the alcohol had worn off.